Leading towards future of electrification with advanced technologies that protect and control the distribution of electricity throughout a facility’s infrastructure. Low voltage industrial controls applications are been cleaner, smarter, and efficient as well as are addressing safety and reliability. This can be achieved with maximizing facility uptime, increased productivity - efficient sizes, ease of installation, minimizing dangers of electrical distribution, and focus on sustainability. It is important to recognize the role played by low voltage industrial controls as an enabling technology. Frequently the performance and efficiency of a large and complex system can be critically determined by the low voltage switchgear within that system. Low voltage switchgear is not therefore simply a component, but can be considered the heart of many systems. Industrial controls are the result of hierarchies of research, design and manufacturing activities across many scientific and engineering disciplines. The industrial control value chain consists large number of switchgear products and components manufacturer, system integrators, government organizations, suppliers and vendors. The organization as a part of the value chain plays very important role, they provide products standard in order to compete with global players. The US and Canada each possess their own set of applicable electrical standards. Major players in this field includes: Rockwell Automation Inc. (U.S), ABB Ltd (Switzerland), Siemens AG (Germany), Schneider Electric (France), WEG SA (Brazil), General Electric (U.S.), Mitsubishi Electric (Japan), Fuji Electric corp. of America (Japan) and CHINT Group (China) among others. This report is focused on giving a detail-view of the complete Low Voltage Industrial Controls Market with regards to the products market and application market with detailed market segmentations; combined with qualitative analysis at each and every aspect of the classifications done by products, application verticals (sectors), sub- applications, and geography. Numbers include revenue, at every level of detail, are forecasted till 2020 to give a glimpse of the potential revenue base in this market. Industrial Controls is considered as one of the most vibrant sector owing to its presence, usage and overlap with many other industry verticals. There is extremely high surge in the market for the technology devices and applications in which these products can be employed. The major factor that is helping this industry to growth is the continuous advancements in the technology and cost effectiveness of products used. The companies are investing in the R&D to make the necessary improvements in technology. Also, the supply chain in this industry is major supporting factor that has helped LV industrial controls industry to gain new heights. Additionally LV Low Voltage Industrial Controls Market are getting strong emphasis due to increase in demand for energy efficient systems. 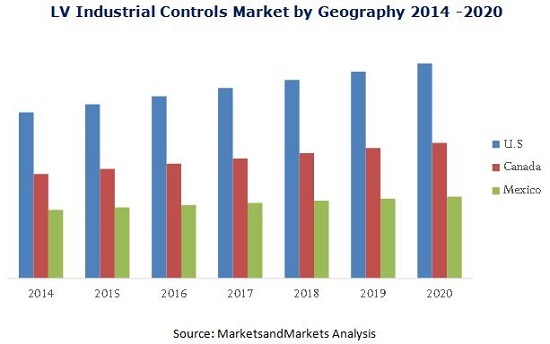 The Low Voltage Industrial Controls Market report is a culmination of extensive primary and secondary research that provide the current size of the LV Industrial controls market (market revenue) and also forecasts the same for the period “2014-2020”.